Got a photo, a web page, or a PDF form on your Android phone that you’d like to print? Nope, there’s no need to send the document to your PC or Mac—and no, you don’t need a newfangled, web-connected printer, either. 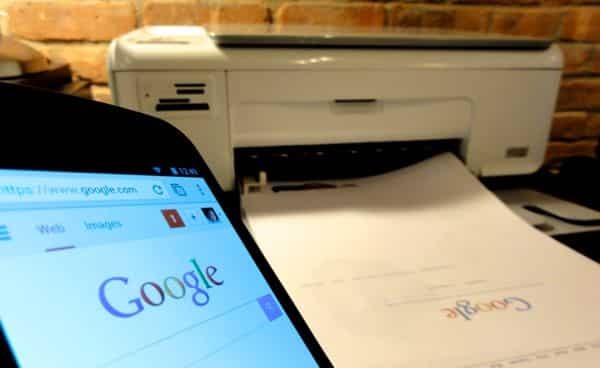 All you really need, in fact, is a) a standard USB printer connected to your desktop or laptop, b) Google’s Chrome web browser, and c) an Android app that works with Google’s handy (and free) “Cloud Print” service. 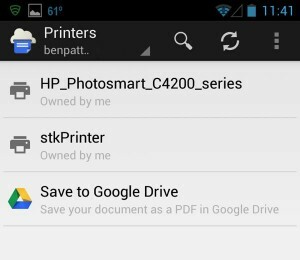 Just select your Cloud Print-connected printer to start printing documents straight from your Android phone. There’s a decent range of Google Print-friendly printers and apps available, and Google just released its own, official Google Print app for Android devices. And while you can get a fancy Google Print-enabled printer that prints documents directly from the web, there’s nothing stopping you from using Google Print with the garden-variety printer you’re using right now. All set? Click the menu button again, select Settings, click “Show advanced settings” at the bottom of the page, then click the “Sign in to Google Cloud Print” button beneath the “Google Cloud Print” heading. Once you’ve signed in to Cloud Print with your Google ID, you can add your printer to your Cloud Print profile. 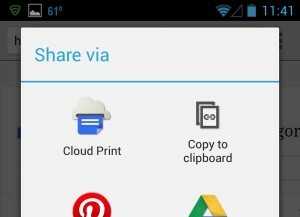 Cloud Print will let you print from any Android app with a Share option. Next, you’ll need to install a Cloud Print-compatible app onto your Android phone. For this example, I’ll go with Google’s official Cloud Print app, just to keep things simple. Also, when you’re setting up your Cloud Print app, make sure to sign in to Cloud Print using the same Google ID you used when setting up Cloud Print in Chrome. Done? If so, let’s try it. First, make sure both your PC and printer are turned on, then launch the Chrome web browser. The Google Cloud Print app (or the Cloud Print app of your choice) should now open. Tap your printer from the list of available Cloud Print printers, take a quick look at the print preview screen, then tap the Print button (it’s the one that looks like an arrow, near the top of the screen). If all goes well, your printer should begin cranking out pages within a minute or so. You can still send documents to Google Print even if your computer and/or printer isn’t powered on; Cloud Print will simply “queue” your print job until your printer is online again.